Where to begin with all the things I love about Schmidt's? It's free of aluminum, propylene glycol, parabens and phthalates, and it also comes in normal and sensitive skin versions. The sensitive skin formula is free of baking soda, an ingredient that's usually the culprit behind underarm skin irritation whenever someone switches to a natural deodorant. This solid twist-up stick is quick, mess-free and convenient to apply. If you're a natural deodorant newbie, its resemblance to a conventional drugstore deodorant also makes the transition that much easier. Schmidt's deodorants come in full- and travel-size versions (bonus points for convenience!) and cost less than $15, putting them on the more affordable side of the natural deodorant spectrum. The hardest part about deciding to try Schmidt's might be picking out a scent: There are fragrance-free formulas, but also a bewildering selection of naturally scented formulas like lavender, bergamot + lime, rose + vanilla, geranium flower, pineapple + coconut...the list goes on. 2 formulas, 2 sizes, an infinite number of scents...no wonder it took me ages to settle on a formula to try! 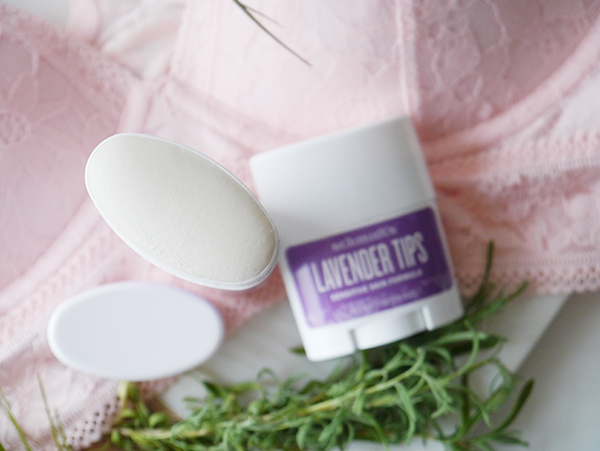 I started by picking up a travel-size version of the Lavender Tips scent in the sensitive skin formula for my barre beauty bag, and I loved everything about it so much that I picked up a full-size stick for home use. This deodorant is a gorgeous experience for all the senses. The lavender essential oil fragrance is spa-like and relaxing. The sensitive skin formula doesn't irritate my underarms and the formula glides on smoothly in a thin layer with a dry, powdery-feeling finish. Like all natural scented products, it goes on strong and fades over time. Even after the initial scent fades though, Schmidt's effectively keeps stale sweaty odours at bay for 8-10+ hours depending on how hot it is and how much I'm sweating. Sometimes I like applying a bit more before barre, but otherwise one application is enough to last me through the day. The only bummer about Schmidt's is that the travel-size holds less product than the size of the container would lead you to believe, so I've used it up faster than expected. My current dilemma is whether I should get the full-size version (better deal, bulkier to carry around) or the travel-size one (more portable, pricier for the amount of product you get) for my barre kit. First-world problem, I know, but I'm just so psyched to have found an effective natural deodorant that's a pleasure to use and doesn't cost an arm and a leg. Natural remedies are popular because they do not harm our body and use only natural ingredients to create.